Annette Renaud was riding the C train last weekend when a man approached and asked to take her picture. It was Brandon Stanton, of the popular website Humans of New York, and as usual, he asked what was on her mind. That’s when Ms. Renaud, a parent who is on the School Leadership Team at the Secondary School for Journalism, a high school housed in the John Jay educational campus in Brooklyn’s Park Slope neighborhood, let loose. She was upset, she said, because students at the school who were trying to qualify for their Advanced Regents diplomas were being undermined by the school’s administration. The advanced diploma requires three years of language study, and the principal at the school had gotten rid of the Spanish teacher at the end of last year and had not replaced her, leaving seniors at the school in the lurch. Someone was listening. The post immediately went viral, with 150,000 likes on the Humans of New York Facebook page, it was shared more than 16,000 times, and it had strangers from across the city and the country pledging to call the school in protest on behalf of the students. Someone in Michigan started a change.org petition calling on the school to hire a foreign language instructor; another Connecticut petition asked the Department of Education to help the students — it has more than 1,000 supporters. People posted the school’s email address and phone number and some later reported that their emails were bouncing back because of the volume of correspondence. The school’s former Spanish teacher, Briana Harris, said she was released from her position because of a lack of resources. “I was excessed, not fired,” Ms. Harris explained. Excessing a teacher is a funding issue that places limits on when a new teacher can be hired. In interviews on Monday and Tuesday, the seniors Alejandra Figueroa, Sammy Familia and Alan Rivera said they set their sights on the distinguished diploma in their sophomore year. It requires six credits of foreign language, which typically translates to three years of instruction, and a passing score on the Regents exam. All three said they took the language test at the end of their junior year and scored in the 90s, well above the required grade. But without another year of instruction, about a dozen students cannot meet the credit requirement. Many scholarships and colleges also require three years of language. Officials at the Education Department said that there have been language courses offered through an online program since the start of the year. Students said that they did not receive the online instruction until January, despite their prodding of the school’s principal, Jodi Radwell, since September. The three students say they were offered a class with students of varying Spanish fluency doing the same worksheets and the option of doing a special project. But Ms. Figueroa’s most recent transcript does not show credit for taking any language courses this year. Another senior, Kenneth Brown, said he did not take the Regents language test in his junior year because he did not feel ready. “I was under the impression I’ll have Spanish 5 and 6 and I’ll be 10 times more prepared as a senior,” he said. But without a teacher this year, he says he is unlikely to pass the exam. Ms. Radwell did not respond to requests for comment. The school’s secretary said that she was in meetings, and a voice mail message was not returned. Before Ms. Renaud’s encounter on the train, the students and their supporters held protests in front of the school about the Spanish classes and other issues. Some students are also protesting class availability and scheduling problems, which they worry may jeopardize graduation. 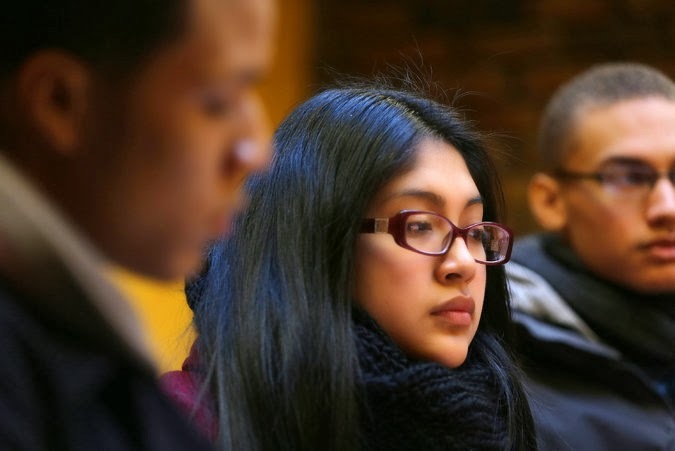 “We continue to work closely with the school community to ensure students have access to the courses they need,” said Marcus Liem, deputy press secretary of the New York City Education Department. Mr. Liem said that officials from the department were planning to meet with the school’s administration about this and other issues even before the posting, but that those meetings have now been moved up. Meanwhile, the students still aim to protest and hope. 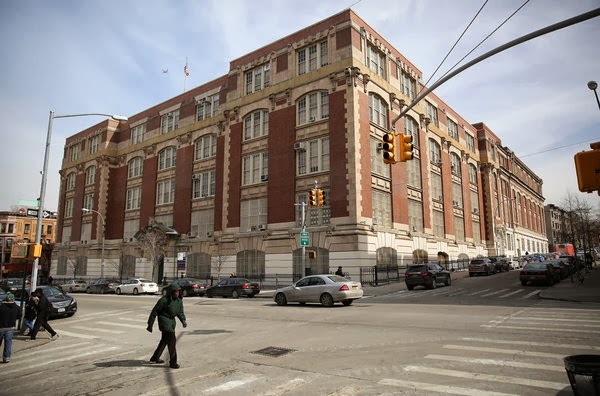 The Secondary School for Journalism, a high school housed in the John Jay educational campus in Brooklyn’s Park Slope neighborhood, has gained national attention after a Facebook post by a protesting parent went viral. Do you have trouble getting information from a public agency pursuant to Freedom of Information Law (FOIL)? The case of Lewis v Giuliani may be helpful. APPLICATION OF DAVID L. LEWIS, and DAILY NEWS, L.P., Publisher of NEW YORK DAILY NEWS, Petitioners, -against- MAYOR RUDOLPH W. GIULIANI, NEW YORK CITY DEPARTMENT OF INVESTIGATION, and HOWARD WILSON, Respondents. NOTICE: NOT APPROVED BY REPORTER OF DECISIONS FOR REPORTING IN STATE REPORTS. In this Article 78 proceeding, petitioners David L. Lewis, a reporter, and his employer Daily News, L.P., the publisher of the New York Daily News, seek a judgment: (1) granting Lewis and the Daily News access and disclosure of certain records of the New York City Department of Investigation ("DOI") and its Commissioner, and (2) enjoining respondents from committing alleged further violations of New York's Freedom of Information Law ("FOIL"), codified in Article 6 of the Public Officers Law ("POL"). Petitioner Lewis is a senior reporter and staff writer for the New York Daily News. For approximately two years, he has been based at the Daily News' City Hall bureau, where his duties include investigative reporting on the activities of the DOI. Section 803(b) of the New York City Charter provides that the Commissioner of DOI "is authorized and empowered to make any study or investigation which in his opinion may be in the best interest of the City, including but not limited to investigations of the affairs, functions, accounts, methods, personnel or efficiency of any agency." The DOI sets forth the results of its investigations in documents known as "closing [*2] memoranda". Such memoranda contain a summary of the investigation and generally conclude either with a finding of wrongdoing or other malfeasance or no such finding. (1) Public Officers Law ("POL") § 87(2)(b), on the grounds that disclosure would constitute an unwarranted invasion of personal privacy; (2) POL § 87(2)(e), on the grounds that [*3] the materials were compiled for law enforcement purposes and disclosure would interfere with law enforcement investigations or judicial proceedings, identify a confidential source or disclose confidential information relating to a criminal investigation, or reveal non-routine criminal investigative techniques or procedures; and (3) POL § 87(2)(g), on the grounds that the records are inter-agency or intra-agency materials which are not statistical or factual tabulations or data, instructions to staff that affect the public, final agency policy or determinations, or external audits. Hirschorn 5/25/95 Letter, at 1. [W]e have concluded that you are entitled to certain redacted DOI documents consistent with the analysis set forth below. DOI's assertion of FOIL exemptions from disclosure springs directly from the agency's investigative function. Law enforcement agencies like DOI conduct investigations confidentially to encourage witnesses to provide information freely, and to protect the privacy and reputation of subjects while facts are gathered. Generally, the law enforcement process takes place in confidence and in secrecy until charges become public in an appropriate adversary forum. DOI's work is preliminary to any such public action that results from an investigation. When a completed investigation substantiates an allegation, DOI provides a report of its work product to other law enforcement offices for prosecutorial evaluation. The preservation of confidentiality as a matter of policy also supports DOI's mission in law enforcement and corruption prevention over the long term. DOI routinely promises confidentiality to witnesses to secure information. Those promises would be worthless, and future witnesses would [*5] be deterred from cooperating with DOI, if information provided in confidence could routinely become public under FOIL. In addition, the investigation of corruption hazards, and the development of anti-corruption strategies and policy recommendations for other City agencies must be kept confidential: to disseminate them freely would make them useless. Melnick 7/24/95 Letter, at 1, 2. Melnick further asserted that the law enforcement exemption "applies both to open, ongoing investigations and to information where there are no pending proceedings", contending that disclosure of information in DOI's investigative files would have a "chilling effect ... on future DOI investigations." Id. at 3. DOI may delete all details that identify persons from its documents. ... Moreover, this disclosure exemption allows redaction of information [*6] that would directly identify a • person (e.g., name, address, employment information) and information that would indirectly identify a person (e.g., the description of a situation from which a third-party with knowledge could infer the person's identity). DOI carefully guards the confidentiality of its witnesses, subjects, and investigations. ... DOI opposes disclosure of its confidential sources or confidential information in its investigative files. ... DOI also refuses to confirm or deny the existence of pending investigations. With respect to DOI's assertion of FOIL'S inter-/intra-agency materials exemption, Melnick affirmed the prior complete denial of production of the closing memoranda, stating that "[p]ublic disclosure of the types of inter-agency, pre-decisional materials sought by your request would adversely affect the governmental deliberative process." Id. at 5. Lastly, Melnick decided that "where applicable, DOI will withhold or redact material on the basis of the official information or public interest privilege", citing BusTop Shelters, supra. According to petitioner, over the next few months, DOI released 882 closing memoranda, "most of which were heavily redacted [*7] and unusable." Totally redacted were the names of the DOI agents and supervisors involved in investigating the cases, as well as the names of individuals found to have engaged in wrongdoing. "Only a handful of the documents" disclosed the name of the government agency or contractor that had been investigated. "In all but a few instances, it was impossible to identify DOI's conclusion and recommendation." (Petition, ¶ 12). In addition, 77 closing memoranda were withheld entirely. Over the following year, the parties met in an attempt to resolve their differences. Although DOI agreed to reconsider its original redactions, according to the petition, "with two small exceptions, DOI stood behind its original decision to produce only highly redacted records which were useless to the public's interest in learning about government." Id. ¶ 13.
we agreed not to challenge DOI's redaction of the names and identifying details in memoranda relating to cases in which the DOI found there was no wrong-doing. Further, we did not challenge the deletion of the names and identifying details of third-party witnesses, including those who gave testimony during the investigations. We did challenge all other redactions, taking the position that the memoranda are final determinations of a government agency to which we are entitled under FOIL. We also specifically challenged DOI's wholesale deletion of the' names, titles, and employment addresses of those DOI officials who took part in the investigation. Burton 1/31/96 letter to the Committee on Open Government, at 1-2.
disclose DOI's work in its cases — the nature of the allegation, investigative steps taken (excepting methods held confidential), and the result of the investigation. The core of DOI's work, how DOI does its work, and the result of DOI's work, can be explained and evaluated from the documents we have released. Mark 9/10/96 Letter, at 1. Thus, respondents knew from the beginning that Lewis was acting in his capacity as a staff writer for the newspaper, and not simply as an individual, "in his own name." Moreover, any doubt which respondents may have harbored should have been dispelled by the fact that petitioners have been represented from the outset by Eve B. Burton, Esq., vice president/assistant general counsel for Daily News, L.P.
As to the merits of this application, it must be noted at the outset that this is not the usual FOIL application. Ordinarily focus is directed at some specific document or case and a FOIL determination can be made on an ad hoc basis relative to the particular circumstances in each case. In the instant case, some 800 separate 1994 memoranda are sought representing respondent DOI's concluded Work for that year and petitioners candidly concede that their request for similar access will be a yearly continuing one. Such a large volume of cases and relevant documents will no doubt implicate various if not all aspects [*11] of FOIL. Therefore in addressing the issues raised by the parties, the court will endeavor to resolve same through a broader analysis of the rights of the respective parties herein under FOIL. [FOIL] proceeds under the premise that the public is vested with an inherent right to know and that official secrecy is anathematic to our form of government. Thus, the statute affords the public the means to attain information concerning the day-to-day operations of State government. By permitting access to official information long shielded from public view, the act permits the electorate to have sufficient information in order to make intelligent, informed choices with respect to both the direction and scope of governmental activities (see Public Officers Law, § 84). Moreover, judicious use of the provisions of the law can be a remarkably effective device in exposing waste, negligence and abuses on the part of government; in short, "to hold the governors accountable to the governed" (NLRB v Robbins Tire & Rubber Co., 437 U.S. 214, 242, 98 S. Ct. 2311, 57 L. Ed. 2d 159). Matter of Fink v Lefkowitz, 47 NY2d 567, 571, 393 N.E.2d 463, 419 N.Y.S.2d 467. To implement this purpose, FOIL provides that [*12] all records of a public agency are presumptively open to public inspection and copying unless otherwise specifically exempted [citations omitted]. ... Exemptions are to be narrowly construed to provide maximum access, and the agency seeking to prevent disclosure carries the burden of demonstrating that the requested material falls squarely within a FOIL exemption by articulating a particularized and specific justification for denying access [citations omitted]. Matter of Capital Newspapers Div. of the Hearst Corp. v Burns, 67 NY2d 562, 566, 496 N.E.2d 665, 505 N.Y.S.2d 576. In matters involving FOIL, "the balance is presumptively struck in favor of disclosure" (Matter of Fink v Lefkowitz, supra, at 571), and "all records" are to be made available for public inspection and copying (POL § 87, [emphasis added] ) except "in eight specific, narrowly constructed instances where the governmental agency convincingly demonstrates its need" to withhold the requested material. Matter of Fink v Lefkowitz, supra, at 571. The agency's asserted justification for denying access must be supported by some "factual basis" (Church of Scientology of New York v State of New York, 46 NY2d 906, 908, 387 N.E.2d 1216, 414 N.Y.S.2d 900) upon which a court may determine whether [*13] the agency's action was proper. In this matter, DOI has identified the exemption or exemptions claimed for each redaction on the "finally reviewed" copies of nine closing memoranda which the parties have designated as representative of the documents which DOI produced, attached as Exhibit P of the answer. However, no information whatsoever has been disclosed to this Court with respect to the 77 entire closing memoranda which DOI withheld. iv. reveal criminal investigative techniques or procedures, except routine techniques and procedures; ... .
None of DOI's notations on the nine representative closing memoranda indicate which subsection or subsections of POL § 87(2)(e) are being invoked to justify redaction. It is clear that material may be properly redacted under one or more subsections under the law enforcement exemption but not under another. Any determination as to the breadth and scope of the law enforcement exemption, or for that matter, any other FOIL exemption must begin with an analysis of the statutory language creating such exemption. "It is fundamental that in interpreting a statute, a court should look first to the particular words in question, being guided by the accepted rule that statutory language is generally given its natural and most obvious meaning [citations omitted]." Matter of Capital Newspapers, Div. of the Hearst Corp. v Whalen, 69 NY2d 246, 251, 505 N.E.2d 932, 513 N.Y.S.2d 367. With respect to § 87(2)(e)(i), its "natural and most obvious meaning" demonstrates that an agency invoking the exemption must establish two things: (1) law enforcement investigation or judicial proceedings (2) with which the disclosure of material would interfere. The absence of either factor bars the applicability of the exemption. While respondents have frequently invoked § 87(2)(e) to justify their redactions and failure to disclose material, they have not identified any closing memorandum as relating to either an investigation which is closed or an investigation which is ongoing [*16] at DOI or another agency or office. In fact, DOI "refuses to confirm or deny the existence of pending investigations." Melnick 7/24/95 Letter, at 5. However, without some factual demonstration that a law enforcement investigation or judicial proceeding in a particular matter continues, the claim for exemption under POL § 87(2)(e)(i) is meaningless, and could well be used as a cloaking device for material which does not fall within any other exemption, but which an agency may wrongfully prefer to keep undisclosed. Thus, if DOI invokes this exemption, it must confirm or deny the existence of pending law enforcement investigations and/or judicial proceedings. numerous criminal activities of alleged organized crime figures, much of it admittedly hearsay but, nevertheless, useful in the work of the police department. The court must assume that police investigation of organized crime is one of a continuous nature and disclosure of this document would critically impede the same and could possibly result in harm to innocent individuals. Id. at 455. After balancing the petitioner's rights with the legitimate needs of the respondent, the Court considered the report exempt under POL § 87(2)(e). However, in this matter, respondents have made no factual showing that such circumstances warranting non-disclosure exist. In order to invoke [*18] the law enforcement exemption for cases in which no other law enforcement investigation or judicial proceeding is yet pending, respondents must make such a factual showing, or no exemption is warranted. In addition to § 87(2)(e), respondents rely on the Fourth Department's decision in Hawkins v Kurlander, 98 AD2d 14, 469 N.Y.S.2d 820, which, in referencing federal Freedom of Information Act cases, found that "the law enforcement investigation exemption 'is not rendered unavailable by the termination of the active investigation relating to these documents'" and that "'[i]f an agency's investigatory files were obtainable without limitation after the investigation was concluded, future law enforcement efforts by the agency could be seriously hindered.'"Id. at 16-17. The Hawkins court precluded disclosure of the transcripts of interviews of witnesses "because of the chilling effect it would have on future investigations by the District Attorney", and opined that "[f]or a court to hold that a promise of confidentiality can be breached merely because the investigation did not lead to criminal charges would raise a red flag for future witnesses who might well decline to reveal confidences to the District Attorney [*19] because of the risk of public disclosure." Id. at 17. Hawkins, however, may not be invoked in support of an all-enveloping exception to an agency's duty of disclosure. [B]lanket exemptions for particular types of documents are inimical to FOIL'S policy of open government (accord, Matter of Capital Newspapers Div. v Burns, 67 NY2d 562, 569, 496 N.E.2d 665, 505 N.Y.S.2d 576). Instead, to invoke one of the exemptions of section 87(2), the agency must articulate "particularized and specific justification" for not disclosing requested documents (Matter of Fink, supra, 47 NY2d, at 571). Matter of Gould v New York City Police Dept., 89 N.Y.2d 267, 675 N.E.2d 808, 653 N.Y.S.2d 54, 1996 WL 681055, at 2 (Court of Appeals, 1996). As an initial matter, Hawkins involved an investigation by the District Attorney of Monroe County into two deaths and a near death of persons undergoing surgery at Genesee Hospital because "the nitrous oxide and oxygen hoses used for the administration of anesthesia had been switched." Id. at 15. Hospital personnel sought the District Attorney's intervention because they believed "that the hoses could not have been switched accidentally". Id. Thus, Hawkins involved a homicide/attempted homicide criminal investigation, which resulted in "insufficient [*20] evidence for presentment to a Grand Jury and no criminal charges [being] filed." Id. [w]hile it may be true that DOI conducts a variety of criminal investigative functions, it is my understanding that it also deals with issues concerning the practices and activities of City employees that may not rise to the level of criminal wrongdoing. Mr. [Richard W.] Mark[, First Deputy Commissioner of DOI,] in fact referred to a portion of the executive order that relates in part to the elimination of corrupt activities and conflicts of interest within agencies. As stated in § 803(b) of the [New York City] Charter, the Commissioner [of DOI] "is authorized and empowered to make any study or investigation which in his opinion may be in the best interest of the City, including but not limited to investigations of the affairs, functions, accounts, methods, personnel or efficiency of any agency." It is my understanding that [petitioners'] request encompasses not only those closing memoranda dealing with criminal activities, but also those dealing with other activities that might be the [*21] focus of certain DOI investigations. The Committee on Open Government's 4/2/96 Advisory Opinion ("Opinion"), at 2. Thus, it would be inappropriate to simply apply the reasoning of the Hawkins court to all the closing memoranda in this matter, without making any distinctions between criminal and non-criminal investigations. In addition, Hawkins must always be read and understood within the overall purpose and tenets of the FOIL. "All records" (POL § 87 [emphasis added]) are "presumptively open to public inspection and copying unless otherwise specifically exempted" (Matter of Capital Newspapers Div. of the Hearst Corp. v Burns, 67 NY2d at 566, supra), and any exemptions are to be "narrowly construed to provide maximum access." Id. DOI's closing memoranda are, by definition, "final determinations" of DOI investigations and are not presumptively subject to the inter-/intra-agency materials exemption (POL § 87[g][iii]), and absent some other applicable exemption, must be disclosed. However, the inapplicability of one exemption does not preclude the applicability of another, and if, after a DOI investigation is concluded, and all other proceedings are completed respondents find that [*22] disclosure of material is exempt under POL § 87(2)(e)(i) or would be imprudent (id., see the discussion above), or that certain sources and information are still truly confidential (POL § 87[e][iii]), or that certain criminal investigative techniques and procedures are still truly non-routine (POL § 87[e] [iv]), or that there has been a subsequent determination absolving one initially charged from wrongdoing, or that some other provision of law requires nondisclosure (e.g. sealing under 160.55 CPL) those materials may be kept undisclosed. It simply must be kept in mind that no agency can use a broad, non-particularized, and non-factually-based application of an exemption as a means of avoiding the agency's duty to disclose - e.g.. by considering or stamping everything as "confidential". Each and every redaction, each and every record withheld must be considered within the context of the overall presumption of accessibility, and the applicability of exemptions which must be narrowly construed and if claimed must be supported by the articulation of a factually supported "particularized and specific justification for denying access." (Church of Scientology of Nev York v State of New York, 46 NY 2d at 908 [*23] supra; Matter of Capital Newspapers Div. of the Hearst Corp. v Burns, supra, at 566. In the same context and applying similar reasoning, respondents' claim for exemption on the ground that disclosure would vitiate the promises of confidentiality which they "routinely" make to their sources (Answer, ¶ 77) may not be maintained. "[I]t is noted that just as promises of confidentiality by the Department do not affect the status of documents as records, neither do they affect the applicability of any exemption. ... ('[T]o allow the government to make documents exempt by the simple means of promising confidentiality would subvert FOIL'S disclosure mandate')." Matter of The Washington Post Co. v New York State Ins. Dept., 61 NY2d 557, 567, 463 N.E.2d 604, 475 N.Y.S.2d 263, quoting Washington Post Co. v United States Dept. of Health & Human Servs., 690 F2d 252, 263, 223 U.S. App. D.C. 139. In addition, respondents have made no showing that they actually made such promises in any of the investigations for which the closing memoranda are at issue herein. Thus, they are improperly asserting a sweeping and indefinite statement of what they "routinely" do, rather than "articulating a particularized and specific justification for denying access." Matter of Capital Newspapers Div. of the Hearst Corp. v Burns, 67 NY2d at 566, [*24] supra. Inasmuch as respondents rely on Hawkins v Kurlander as ground for their assertion, they are in error. The situation in Hawkins is distinguishable from the case at bar because in Hawkins "[r]espondent ... entered into an agreement with hospital administrators whereby they would cooperate with the investigation in exchange for confidentiality." Id. at 17. No such agreement has been shown here. In sum, if there is any doubt as to the presumptive availability of law enforcement records under FOIL it was dispelled by the Court of Appeals in Gould (supra) which held in a case which was concluded that such documents as police complaint follow-up reports, activity logs, witness statements, and detectives' reports are not, per se, exempt from FOIL in the absence of a "particularized and specific justification" under an appropriate FOIL exemption provision. redacted the names of the City Marshals who are the subjects of DOI disciplinary action, other than those resulting in removal from office, in accordance with the guidance of the Appellate Division, First and Second Departments, which has statutory supervision over the marshals and has advised DOI that such information should not be disclosed. Although DOI has treated its redactions of the identities of City Marshals from its closing memoranda as based upon one exemption, it has actually improperly commingled two distinct exemptions, to wit: personal privacy and the "Judicial Exemption" referred to in the Appellate Division's response to respondents inquiry, and has attempted to apply the resultant amalgam. the release of information regarding disciplinary action taken against marshals should not include the identities of the individuals involved in cases where the sanction imposed was less than removal from office. However, without specific direction from the Appellate Division with respect to the application of the personal privacy exemption to records which refer to New York City Marshals, any assumptions respondents made concerning the Appellate. Division's position on the matter were improper and based upon sheer speculation. In any event, the proper standard to be employed is that which was applied by the Committee on Open Government (infra). (a) The committee on public access to records may promulgate guidelines regarding deletion of identifying details or withholding of records otherwise available under this article to prevent unwarranted invasions of personal privacy. In the absence of such guidelines, an agency may delete identifying details when it makes records available. v. [*28] disclosure of information of a personal nature reported in confidence to an agency and not relevant to the ordinary work of such agency. Respondents allege that "DOI may delete all details that identify persons from its documents" because "the Committee on Open Government ... has not promulgated any rules particularly describing what constitutes an unwarranted invasion of personal privacy". Melnick 7/24/95 letter, at 4. Respondents' reliance on POL § 89(2)(a)'s provision that "[i]n the absence of ... guidelines, an agency may delete identifying details when it makes records available" as ground for its wholesale deletion of identifying details in the closing memoranda is flawed. As the statute makes clear, the purpose of the provision is "to prevent unwarranted invasions of personal privacy." Thus, unless the disclosure of identifying details in records which are otherwise available would result in unwarranted invasions of personal privacy, their deletion is not authorized by the statute, whether guidelines regarding deletion have been promulgated by the Committee on Public Access to Records, or not. [t]he statutory authority to delete identifying details [*29] as a means to remove records from what would otherwise be an exception to the disclosure mandated by the Freedom of Information Law extends only to records whose disclosure without deletion would constitute an unwarranted invasion of personal privacy, and does not extend to records excepted in consequence of [other] specific exemption[s] from disclosure. Matter of Short v Board of Mgrs. of the Nassau County Med. Ctr., 57 NY2d 399, 401, 442 N.E.2d 1235, 456 N.Y.S.2d 724. "[T]here is no counterpart to this subdivision in which provision for deletion is made with respect to records sheltered from disclosure under any of the other seven categories." Id. at 405. Thus, DOI's deletion of names and identifying details, if asserted under any other provision of FOIL (e.g., DOI's effort to protect the names of its investigative employees under "FOIL's law enforcement exemption" [Answer, Par 80]), is unwarranted. Thus the personal privacy exemption may not be invoked to withhold the names and identifying details of individuals who were found to have engaged in wrongdoing. However, as to those who have been cleared of such charges non-disclosure would be appropriate and in fact petitioners do not press for access in such cases. "'Application [*30] of the privacy exemption from FOIL disclosure requires a balancing of the subject person's expectation of privacy against the statutory policy favoring the right of the public to information concerning the operations of government'." Matter of Newsday v New York State Dept. of Health, 1991 WL 285624 (Sup. Ct. Albany County), at *2, quoting Matter of Dobranski v Houper, 154 AD2d 736, 738, 546 N.Y.S.2d 180. For example, in the May 17, 1994 redacted closing memorandum, the charge that an individual "gave cash rewards to [Department of Parks and Recreation] employees for work performed by them in the regular course of their jobs" was "substantiated" by DOI's investigation. The memorandum stated that by accepting such gifts, the DPR employees may have violated sections of the New York City Charter and decisions by the Conflicts of Interest Board, and, if such gifts were in excess of $50, the individual who gave them violated the provisions of the New York City charter and the DPR Code of Conduct. Nevertheless, in addition to the redaction of the names and identifying details of the individual and the DPR employees involved, several inches of material following the sentence, "The [*31] following actions are recommended" were redacted, pursuant to POL "§ 87(2)(b) and (e)". It seems fairly obvious that the acceptance of illegal gifts by City employees and the offering of illegal gifts by an individual are not activities which should be either condoned or protected. Similarly, it would seem clear that "information of a personal nature" tied into such a practice cannot be said to be either "not relevant to the work of the agency requesting or maintaining it" (POL § 89[b][iv]) or "not relevant to the ordinary work of such agency" (POL § 89[b][v]). It also seems clear that, in balancing the public's interest in seeing what steps its government takes to see that these activities cease with any expectation of privacy which individuals involved in these activities may have, the scales tip unquestionably on the side of the public's right to information concerning the operations of government. Thus, DOI erred in redacting such material under the auspices of the personal privacy exemption. Although the standard concerning [*32] privacy is flexible and may be subject to conflicting interpretations, the courts have provided substantial direction regarding the privacy of public employees. First, it is clear that public employees enjoy a lesser degree of privacy than others, for it has been found in various contexts that public employees are required to be more accountable than others. Second, with regard to records pertaining to public employees, the courts have found that, as a general rule, records that are relevant to the performance of a public employee's official duties are available, for disclosure in such instances would result in a permissible rather than an unwarranted invasion of personal privacy [citations omitted]. Conversely, to the extent that records are irrelevant to the performance of one's official duties, it has been found that disclosure would indeed constitute an unwarranted invasion of personal privacy [citation omitted]. In situations in which allegations or charges have resulted in the issuance of a written reprimand, disciplinary action, or findings that public employees have engaged in misconduct, records reflective of those kinds of determinations have been found to be available, including [*33] the names of those who are the subjects of disciplinary action [citations omitted]. Similarly, even though the sanction was far short of removal from office, it was recently held that a settlement agreement between an employee and an agency was available insofar as it included admissions of misconduct [citation omitted]. Opinion, at 7-8. Thus, the name and any identifying details of the City Marshal which were redacted from the March 30, 1994 closing memorandum should not have been withheld. In addition, the above standard must be applied to any other closing memoranda which refer to City Marshals who have been found to have engaged in wrongdoing. DOI investigative staff perform a variety of roles, including undercover work. Identifying by name the DOI staff who investigated a particular matter potentially undercuts their future effectiveness by disclosing the type of investigative work they do or particular activities they have investigated. In such matters, deference is due to the judgment of the law enforcement agency. To the extent that disclosure of employee information [*34] serves to promote "open government" by holding employees accountable for their work performance, such purpose is served by DOI's disclosure of the names and titles of the DOI supervisors who approve the disposition of the investigation and sign the closing memoranda. The Court notes that DOI has asserted only the personal privacy exemption with respect to its investigative employees, and not the exemption which permits denial of access to material which "if disclosed would endanger the life or safety of any person" (POL § 87[f]). However, in their answer, at ¶ 42, respondents mention in passing that "disclosure of the specific activities of the agency's field investigative staff would risk their safety". However, assertion of such exemption requires a greater degree of "particularized" and specific justification than has been offered by respondent. Any effort by DOI to keep the names of its investigative employees undisclosed under POL § 89(2)(b)(iv) or (v) may not succeed because information concerning the identities of persons doing the agency's work is "relevant to the work of the agency requesting or maintaining it" and is "relevant to the ordinary work of such [*35] agency." In addition, because the purpose of the exemption is to prevent the "unwarranted invasion of personal privacy" (emphasis added), DOI may not engage in mantra-like invocation of the personal privacy exemption in an effort to "have carte blanche to withhold any information it pleases" (Kneel v Ravitch, 93 AD2d 422, 426, 462 N.Y.S.2d 182, affd 62 NY2d 1, 464 N.E.2d 118, 475 N.Y.S.2d 814), especially with respect to information about its employees. Since tax dollars are spent to pay public employees, the public has a right to know certain facts relating to such employment. This is not to say that public employees do not have a right of privacy. However, the acceptance of public employment carries with it a realization that certain facts relating to such employment must be public knowledge. This includes, for example, a public employee's name, public office address, title and salary (Public Officers Law § 87[b]). Matter of Capital Newspapers Div. of the Hearst Corp. v Burns, 109 AD2d 92, 94, 490 N.Y.S.2d 651, affd 67 NY2d 562, 496 N.E.2d 665, 505 N.Y.S.2d 576. Insofar as such disclosure may impact upon a public employees' personal privacy, it is nevertheless permissible. Respondents' assertion (Answer, ¶ 80) that "[i]n such matters, deference is due to the judgment of the law enforcement [*36] agency" is without merit, because "since construction of the statutory exception from disclosure dealing with unwarranted invasion of privacy involves pure statutory reading and analysis, there is no basis to rely on any special expertise of [DOI] and thereby accord its statutory interpretation any particular deference." Id. Lastly, to the extent that respondents withheld material under the personal privacy exemption because it was proffered to them in confidentiality, such material must be disclosed, absent some other exemption, because the fact "[t]hat the documents may have been furnished in confidentiality does not render them beyond the scope of FOIL disclosure [citations omitted]." Matter of New York 1 News v Office of the President of the Borough of Staten Island, 231 AD2d 524, 647 NYS2d 270, 272. [c]losing memoranda contain more than DOI's final determination in a case. The document summarizes the allegation, steps taken to investigate the allegation (including witness identities and confidential operations), the agency's analysis of the facts, recommendations that grow out of the factual predicate, and the result of DOI's work. DOI properly applied the exemption for intra-agency material to redact portions of closing memoranda that reflect investigative work product, strategy and analysis. DOI also redacted the policy or procedural recommendations it suggested to other agencies (as reflected in the closing memoranda), under the inter-agency exemption. In both cases, the exemption was used properly to protect pre-decisional, deliberative recommendations, analysis, and similar materials. Mark 3/14/96 Letter to the Committee on Open Government, at 3, 10.
to protect the deliberative process so as to ensure the uninhibited right and need of the agency to rely upon opinions and recommendations not only of its own employees, but also of temporary consultants since "efficient government operation requires open discussion among all government policy makers and advisors, whether those giving advice are officially part of the agency or are solicited to give advice only for specific projects" ([Matter of Sea Crest Constr. Corp. v Stubing,] 82 AD2d, at p 549). Although the term "factual data" is not defined by statute, the meaning of the term can be discerned from the purpose underlying the intra-agency exemption, which is "to protect the deliberative process of the government by ensuring that persons in an advisory role [will] be able to express their opinions freely to agency decision makers" [citations omitted]. Consistent with this limited aim to safeguard internal government consultations and deliberations, the exemption does not apply when the requested material consists of "statistical or factual tabulations or data" (Public Officers Law § 87[g][i]). Factual data, therefore, simply means objective information, in contrast to opinions, ideas, or advice exchanged as part of the consultative or deliberative process of government decision making [citations omitted]. Id. at *3. The Court explained that the documents requested in that case were "not categorically exempt as intra-agency material", but that the agency was entitled to withhold documents "under any other applicable exemption, such as the law-enforcement exemption or the public-safety exemption, as long as the requisite particularized showing [*40] is made." Id. at *4. Thus in Gould the Court would not, in the absence of specific particularization, exempt such law enforcement documents as police complaint follow up reports, activity logs, witness statements and detective reports. Respondents have not considered or reconsidered the withheld material under this standard. An obvious example of improper redaction under this standard is respondents' consistent deletion, using § 87(2)(g) as their authority, of the case names, case numbers, DOI numbers, and subjects on the representative closing memoranda. These, as well as the redacted material above the page numbers of the May 17, 1994 closing memorandum, are obviously purely factual data/objective information, devoid of even the possibility of disclosing any "opinions, ideas, or advice exchanged as part of the consultative or deliberative process of government decision making.". Thus, unless this material falls squarely within another exemption, it must be disclosed. As noted earlier, respondents withheld or redacted material "on the basis of the official information or public interest privilege", citing BusTop, Supra. Melnick 7/24/95 Letter, at 6. Respondents' [*41] reliance upon BusTop is ill-founded. For one thing, the court in BusTop observed that the parameters of the inter-/intra-agency materials exemption were "far from clear." (Bustop Supra, P. 706) Such is no longer the case (See Gould, Supra). In addition, in relying upon Bustop as its authority to assert common-law privileges, respondents ignore the fact that that Court applied the official information or public interest privilege within CPLR Article 31, not FOIL stating ("it is unnecessary to rely on the [FOIL] in determining this application since the [FOIL] provides that it shall not be construed to limit otherwise available rights of disclosure. [Public Officers Law, § 89,. ]"; and, "it should be clear that disclosure requested under the rights granted by the [FOIL] must be provided unless it is protected under a specific exemption of the [FOIL] itself."). Id. at 706, 711. "CPLR article 31 is not a statute 'specifically exempt[ing]' public records from disclosure under FOIL (Public Officers Law, § 87, subd 2, par [a])." Matter of M. Farbman & Sons v New York City Health & Hosps. Corp., 62 NY2d 75, 81, 464 N.E.2d 437, 476 N.Y.S.2d 69. [t]he public policy concerning governmental [*42] disclosure is fixed by the Freedom of Information Law; the common-law interest privilege cannot protect from disclosure materials which that law requires to be disclosed [citation omitted]. Matter of Doolan v Board of Coop, Educ. Servs., 48 NY2d 341, 347, 398 N.E.2d 533, 422 N.Y.S.2d 927. In addition, the Court of Appeals has held that "FOIL expressly refers to statutory exemptions so that a common-law privilege is inapposite." Matter of The Washington Post Co. v New York State Ins. Dept., 61 NY2d at 567, supra. Thus, respondents' attempt to invoke a "common-law privilege" to avoid disclosure under FOIL is unwarranted. In this matter, the various and multiple stages of respondents' responses to petitioner's requests, beginning with their complete denial of any disclosure, and ending, after protracted incremental unveilings, with their "final" disclosure to petitioners of the heavily redacted closing memoranda is inconsistent with the mandates of FOIL as directed by our Court of Appeals in the many cases herein cited. The law provides for maximum access, not maximum withholding, and that agency policy or procedure must narrowly construe exemptions under FOIL. In view of the foregoing analysis, the Court makes [*43] the following directions with respect to disclosure of DOI's closing memoranda. 1. Where a closing memorandum contains no finding of wrongdoing and no recommendation for further governmental action, that memorandum need not be disclosed. Neither must it be disclosed where, though an initial finding of wrongdoing by DOI, had been made there has been a subsequent acquittal or dismissal of charges in favor of the alleged wrongdoer. 2. Where the closing memorandum contains a finding of wrongdoing or other violation of statute or rule, or contains a recommendation for further governmental action or proceedings, its unredacted contents must be produced for inspection and copying by petitioner unless some specific exemption under FOIL would warrant non-disclosure (e.g, a still pending criminal proceeding). In such circumstances the justification for such exemption must be particularized and rationale stated. If it is claimed that such particularization would reveal details that would defeat the purpose for the exemption, appropriate remedies exist to determine the legitimacy of such claim viz, in camera review. In order to implement the Court's directions and provide some specific application [*44] thereof in this proceeding, the respondent is directed to produce unredacted copies of the nine "representative" memoranda submitted by petitioner in this application before a Special Referee for in camera inspection, to hear and report (with recommendations) on: what material, if any, may be withheld by respondents in conformity with this decision and whether petitioners should be awarded costs, including reasonable attorneys' fees. Counsel shall serve a copy of the settled order upon the Legal Support Office to obtain a hearing date.